The Brewers will be hoping to get some good news today. First baseman Eric Thames jammed his glove hand into the ground to field a ground ball in the eighth and bent his thumb back. 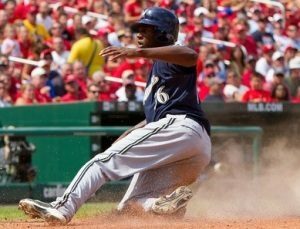 Thames left the game after the inning and is set to undergo an MRI on Wednesday. Manager Craig Counsell said they’re a little concerned about the thumb after the game. Thames has seven home runs in the month of April. If he has to miss time, Jesus Aguilar would take some of the time at first base and it’s possible that Ji-Man Choi could return from the minors. The Brewers are 15-9 on the season, winners of seven straight games.